Lapointe, Pierre Louis. "Châteauguay". The Canadian Encyclopedia, 04 March 2015, Historica Canada. https://www.thecanadianencyclopedia.ca/en/article/chateauguay. Accessed 20 April 2019. The name is a throwback to the seigneury of Châteauguay granted to Charles LE MOYNE in 1673. The seigneury was first known as "chasteau de Guay," a combination of Le Moyne's fortified manor or chasteau (château), and the name Gué or Guay, of the caretaker. It eventually became today's Châteauguay. Châteauguay, Qué, City, pop 41 003 (2001c), 41 423 (1996c), 42 262 (1991c), area 35.89 km2. Incorporated in 1912, it later merged (1975) with the town of Châteauguay-Centre (inc 1960) to create the present entity. The city is located on the South Shore of the St Lawrence River at the mouth of the Rivière Châteauguay, about 25 km southwest of MONTRÉAL. The name is a throwback to the seigneury of Châteauguay granted to Charles LE MOYNE in 1673. The seigneury was first known as &QUOT;chasteau de Guay,&QUOT; a combination of Le Moyne's fortified manor or chasteau (château), and the name Gué or Guay, of the caretaker. It eventually became today's Châteauguay. The chateau sat on Île de Saint-Bernard, at the mouth of the river. The island is still topped by a beautiful and elegant masonry tower dating back to the late 1680s. It is a remnant of one of the oldest windmills in North America, which was used originally as a control post and fortification to oversee the entrance to Lac Saint-Louis. During the WAR OF 1812, Châteauguay was an outpost for the British army. 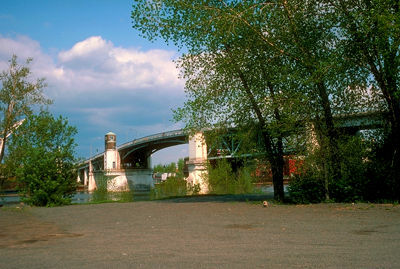 One of Canada's most significant battlegrounds, the site of the Battle of CHÂTEAUGUAY, is 30 km upstream from the city. In October 1813 Lieutenant-Colonel Charles-Michel de SALABERRY, who was stationed in Châteauguay, rushed to this spot where he and his men defeated a larger American invasion contingent led by General Wade Hampton. The battleground is now a national historic site. This largely French-speaking community (66%) is a well-organized residential suburb of Montréal with a large industrial park. The city hall is a restored mid-19th-century Roman Catholic convent founded and administered by the Sisters of the Congrégation de Notre-Dame. Also of interest is the historic Saint-Joachim Roman Catholic church, dating back to 1775.